November the fifth is a memorable day, one where I usually find myself watching V for Vendetta with a big bowl of popcorn and some friends. But now that I find myself on the Coast of England and just a half hour away from the Bonfire Capital of the World – well, I decided I had to check it out. So last week, we did just that! We headed to Lewes on the train after waiting in a relatively short queue. We even managed to snag seats, we seemed to be in the clear, and I wondered just how packed this celebration would be. It was packed. I’m talking 30,000 people. 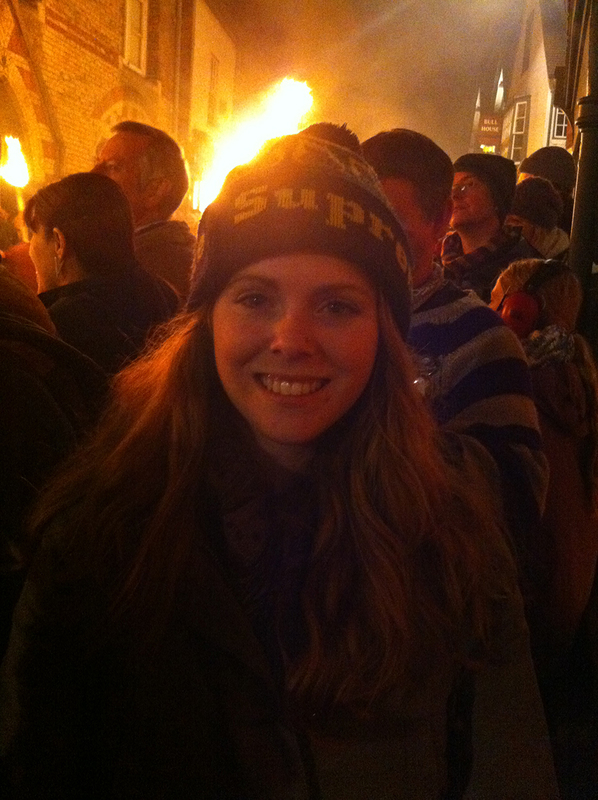 It was incredible, the tiny streets filled with crowds of bonfire goers, from tots to teens to grandparents. We made our way towards the parade, dodging drunks and people with flaming torches. 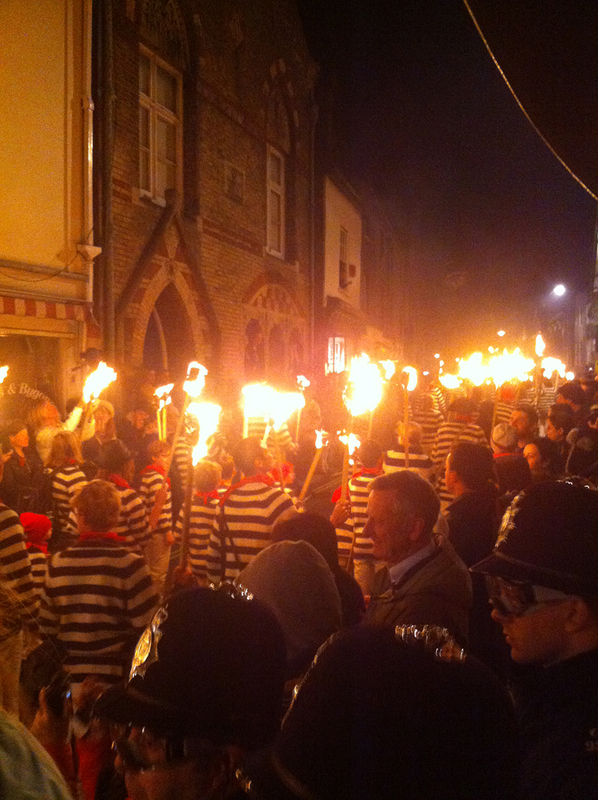 The parade is made up of several bonfire societies, all of them dressed in different costumes. Some were simple, just striped shirts and maybe some face paint, while others were dressed as the Pope or Native Americans with massive headdresses. Basically, if this were to happen anywhere else in the world, there would be havoc and a lot of ridicule. But it’s been a tradition here for so long it’s just something to look forward to each year. And a good excuse to drink in public. How outrageous the event is is what draws the massive crowds. Also, it is a lot of fun, so long as you don’t get too offended. Now, I had been warned about bangers but wasn’t sure what to expect. Until one landed next to my feet and exploded. I shrieked, covered my head and wondered what had just happened. Oh yeah, get used to that, it’s going to happen. A lot. Eventually the heat from all of the flames and the noise from all the bangers and fireworks blended into the night…it just became natural. And it was amazing, I really couldn’t believe my eyes. So, if you were to go to this event uninformed about why they do it, you might be a little shocked at seeing burning crosses and the like. But if you know that November fifth was the uncovering of the gunpowder plot back in 1605 – yes, Guy Fawkes and his crew had plans to blow up the House of the Lords but were thwarted. So now we burn effigies, set off fireworks and get a little rowdy. It’s also quite anti Catholic, hence the burning/exploding Pope. Mind you, it’s definitely not as violent as it used to be, and I’m glad for that. Also, in terms of the offensive parts, it’s all meant to be in good fun, but I guess it would depend where you stand in terms of your religious and political views. I tried to not think about it and just experience the event with an open mind. Here are some photos from Jack’s iPhone, quality isn’t best, but photos couldn’t do justice to how grand it truly was in any case! We ended our night at Commercial’s bon fire. 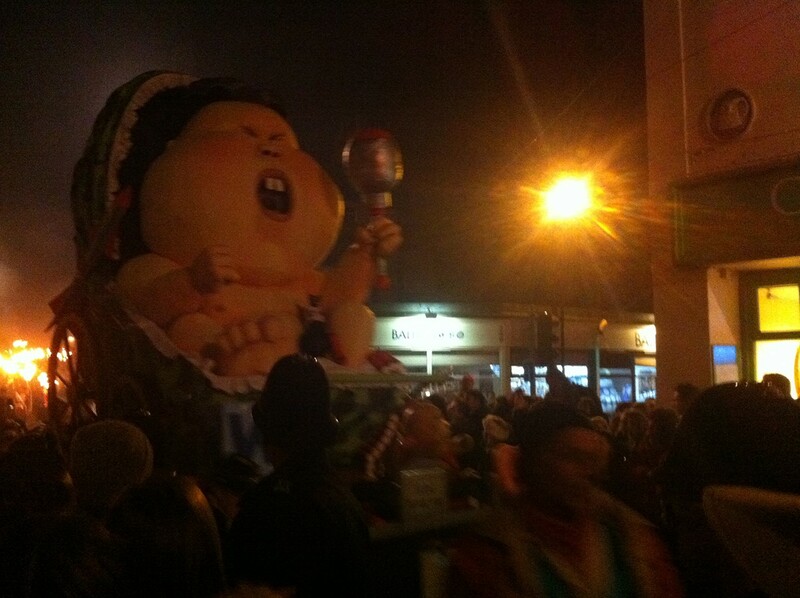 They had several effigies, including the Pope, Guy Fawkes and what I believe was either Kim Jong Un or Kim Jong Il as a giant baby. It had missiles strapped to it’s giant pram. Everyone threw their torches at the massive pile of wood with Guy Fawkes sitting on the top. It had to be three storeys high. Eventually it was billowing a lot of smoke. 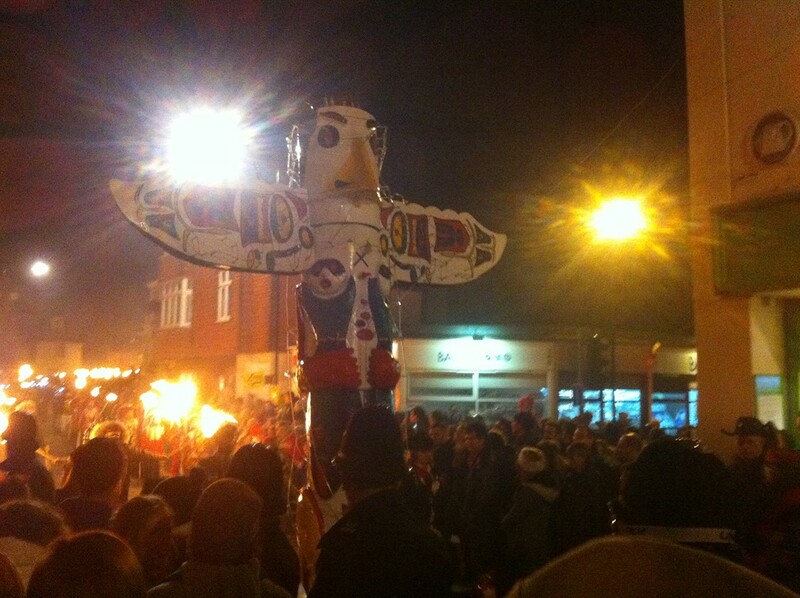 Next came the fireworks, and the effigies blew up in a rather comical fashion. And the fireworks, they were amazing. Better than anything I had ever seen at any Canada day or Fourth of July celebrations. Sorry North America, but bonfire night really kills it in the fireworks department. And that was only ONE bonfire society. There were several more around the city. All in all, a successful night. The train ride home was less than comfortable, as we waited for over an hour in a massive line full of drunk teenagers. But I was still basking in the glow of a great evening. I really would like to encourage everyone to make their way to Lewes at least one November in their lifetime to experience this evening. Just don’t take it too seriously. Oh, and have a few beers. Dodge some bangers. Laugh.